BobCAD-CAM, Inc. is a global pioneer in CAD-CAM technology for Design & CNC manufacturing. Their BobCAD-CAM v27 software is used by manufacturers to import and design parts for machining and then it creates the toolpath and NC g-code program that is used to control the machine tool. 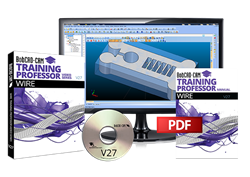 They have just released their new BobCAD v27 Wire EDM Training Professor Video Series to teach users everything they need to know when using the software to design, edit and machine parts with their v27 2 & 4 Axis Wire EDM CAD-CAM software. A hard cover copy of the training manual can be purchased separately but is included as a digital PDF copy. Importing part drawings and geometry editing. Using 2 & 4 axis machining operations for open and closed shape profiles. Creating 2 & 4 Axis NC g-code programs and using simulation for 2 or 4 axis Wire EDM. For more information on this new BobCAD v27 Wire EDM Training Professor Video set contact BobCAD-CAM directly at 877-262-2231 or 727-442-3554. You can also download a free trial at http://bobcad.com.